To say that 2018 was interesting for WordPress would be an understatement. The past year was no less than a rollercoaster ride for the biggest CMS and its community. WordPress users saw major changes coming to the publication experience and the significant implications it had on the WordPress development. While WordPress 5.0 and Gutenberg has the potential to open up new possibilities for plugins and themes developers, it also made the old timers to choose a side in 2019. Other than that, there were major acquisitions that shifted roadmaps of many WordPress companies. We also saw the WordPress community spreading to newer landscapes as more and more WordCamps took place all around the world. Being a part of such a versatile industry, one cannot stay stationary. Which is why in 2018 we decided to rebrand WPblog with a new look and a logo. We partnered up with bigger WordPress companies and influencers to escalate our growth. Let’s first talk about the long-awaited or should I say the long-hated new version of WordPress with new publishing experience a.k.a Gutenberg came out at the end of the year, just before WordCamp US. The new Gutenberg editor wasn’t really welcomed with open arms and there was a clear divide in the WordPress forums on whether to update to WordPress 5.0 or not. Whether you are using Gutenberg or not, one agrees that it entirely delivers on promises to allow more flexibility in displaying content while also making multimedia embedding more simple. Content added to the webpage not get their own block, which makes it easier to manoeuvre it around using the mouse. The update also shows more templates in terms of these content blocks, so users can select a heading, subheading or content style. A week into the WordPress update, hackers attempted a dictionary attack on many WordPress websites. According to a WordPress security firm, about five million login attempts were made with over 20,000 bots as they used various combination of passwords to log into the WordPress admin panel. Mikey Veenstra, a security research analyst said the top of the chain botnets scan for infected WordPress websites that can be potential victims. 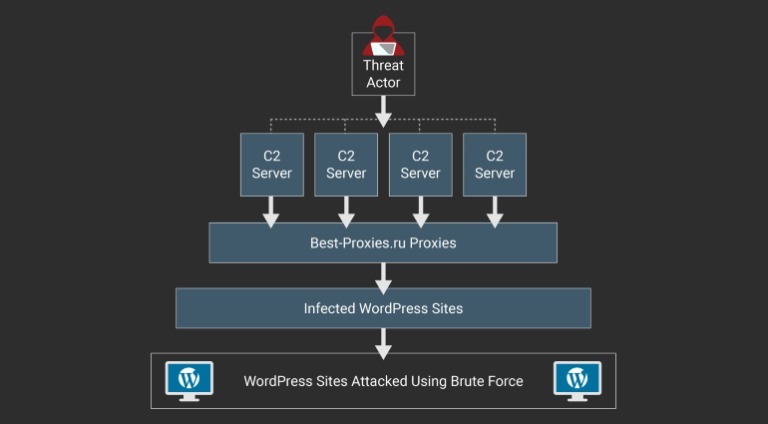 It’st worth mentioning that the team at Defiant; a firm that deals in WordPress security services went into this attack providing the entire back-end structure of this attack. This was particularly useful for WordPress developers as it gave them a peek inside the hacker operations. WordPress had to deal with another cyber-crime took place In October. Syber Waaijer – a Dutch security researcher discovered the vulnerability and reported it to the developers. The vulnerability was found in AMP – A popular WordPress plugin. A WebARX Blog published a proof of concept code that showed how to exploit the code. Hence, it took no time for developers to commence the attack. WordPress eventually removed the plugin from its repository. The third major vulnerability was found by Simon Scannel – a security researcher from RIPS technologies highlighted in his blog that a vulnerability specifically impacts WooCommerce. The vulnerability allows shop managers to delete certain files on the server and then take over any administrator account. The remedy provided for this exploit was for shop managers to inject a payload and delete the WooCommerce plugin. This would ultimately disable run-time restrictions and allow shop managers to take over the admin account of the store. Seeing the trends of security threats over the years in WordPress, it is safe (actually unsafe) to say that in 2019 WordPress Security will be one hot topic. The WordPress ecosystem has always been a melting pot. Year after year we see WordPress companies coming together to make bigger and better products. 2018 was no different. In the summer of 2018, WordPress.com’s parent company, Automattic, acquired the Brooklyn based startup, Atavist. Automattic took hold of the startup, its magazine and the entire team. The acquisition was interesting because Atavist offers a paywall and a subscription model and speculations rose that WordPress.com might now be offering a similar model. A month later, Southern Web acquired WP Site Care. For those who don’t know, Southern Web is a digital agency for businesses that need a strong online presence for their growth. This acquisition contributed to Southern Web’s mission to help their clients with brand exposure, sales, conversions, traffic and more. Speaking of the WordPress ecosystem, you just can’t keep Syed Balkhi out of the limelight. WP Forms, one of the WordPress products from his portfolio, acquired Pirate Forms which was a big deal on the WordPress repository. The plugin has more than 300,000 active installs and was created by ThemeIsle. In May 2018, Google Analytics Dashboard for WordPress was acquired by Exact Metrics. The plugin is the second most popular analytics plugin on the repository with more than 17 million downloads. The acquisition will only see a change in the name and the logo of the plugin. Since Exact Metrics is owned by Syed Balkhi, this acquisition will only add the plugin in his portfolio which includes the likes of Monsterinsights, WP Forms, and OptinMonster. WP Engine made a couple of highlights in 2018 after it acquired StudioPress and Array themes. StudioPress is the creator of Genesis framework which is the most popular theme framework for WordPress. This acquisition further enhances the digital experience of, arguably, the most powerful WordPress hosting platform. WP Engine didn’t stop there. It further jazzed up its portfolio by acquiring Array themes from Mike McAlister. The amazing thing about these acquisitions is that not only they are a great value addition to WP Engine’s value proposition, but these acquisitions also bring in years of priceless experience through teams and individuals. Within the realm of themes, LiquidWeb acquired iThemes in early 2018. LiquidWeb operates under the umbrella of WordPress. The company sources confirmed that this was a multi-million dollar acquisition. iThemes also confirmed that they would continue to work as an independent unit in LiquidWeb. September last year, also brought the news of Phil Derkson, founder of WP SimplePay joining Sandhill Development family. Pippin Williamson, the founder of the acquirer company had met Phil a number of times and discusses possible collaborations in order to improve the product and infrastructure. According to Pippin, current customers of WP SimplePay will continue to get these services while and should see improvements in the payment mechanism in the recent future. In 2018, WordPress made its WordCamp footprint impressions about 147 times globally. These camps comprised of developer conversations, updates on acquisitions, the general direction of the companies affected, and spotlights on influential WordPress community members. If you’d like to be part of these conventions, you can find one happening near you by clicking here. Reaching the end of 2018, WordCamp US made its impact with greater expectations compared to the preceding years. The event attendees summed up to about just under 2,000 with the exclusion of 2,000 users that joined the live stream. In June, this was the first time a Web App was created that allowed attendees to flag individual events they were interested in. The conference did not require attendees to download an app from Play Store or App Store, instead of an event-specific URl and prompted users to download a more targeted App. Last year, our Blog got a fresh look! We’ve added a new skin, revamped the logo and plan to sustain our awesomeness! We’d like to take a moment and thank all our readers in helping us grow by 1000% subscribers, providing you all with more than 100 articles and featuring four plugins per month. We worked tirelessly for a little over a month, but we finally got it! We managed to refresh everything from the colour scheme, design template and the logo. Back then, we didn’t really focus on creating a logo as we already on a journey of being content rich and wanted to focus on that completely. However, recently we decided to touch up the logo to make it more reflective of what we do. So the logo covers everything from information blogging to writing everything WordPress. Apart from the logo, we also revamped the Ebook landing page to make it more sophisticated while preserving the highlights of the book being reviewed. Following the universal code, we also reshaped our footer to contain more user-friendly information, showing featured blog articles. Furthermore, we’ve shifted the navigation links to be more centred instead of leaving them on the top right corner. While WordPress powers about 30% of websites on the internet, Malcare – a security service provides protection against hack attempts. It detects malware, removes it and adds security against websites that have a high probability of containing malware. The service does not entail a Malware scanner & cleaner, Malware Firewall, Login Protection, Website Management, Uptime Monitoring, White Labelling and client reporting. This malware anti-dote has proven time and again how it stays ahead of its time and provides the type protection a user would need. The second featured plugin of the month is MemberMouse. This is a plugin that ideally helps businesses with high-volume merchants. The plugin features help web page admins in dealing with sales, delivery, content protection, affiliate management, targeted marketing, and business management. SlideDeck is the third featured WordPress plugin of the month. Considering how most websites have sliders, banners, sections for videos, gallery and even infographics, this firm caters to exactly that. This plugin has special significance today mobile browsing is on the rise. Hence, to be able to improve the website aesthetics in terms of UI. The page designer can use a wide array of customizable content with these plugins. S/he can also live preview the webpage to see changes. Last but not the least, WEGLOT is our fourth featured plugin for 2018. In order to optimize the web page, it’s important to go through a checklist before publishing the content. More often than not, user forgets about the readability of their content in a different language. This is where WEGLOT comes in. 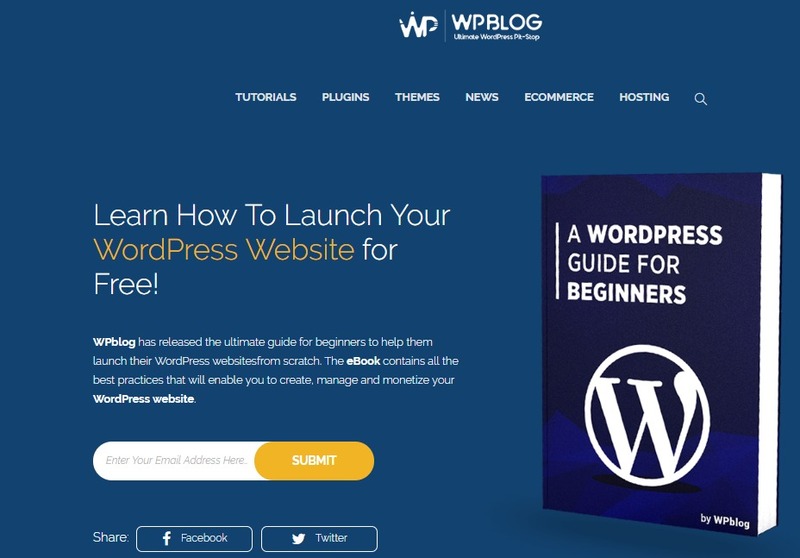 Partnership with WordPress developers and bloggers. Mario Peshev; CEO at DerviX talked about WordPress Security features in an interview with us. He provides high-scale solutions in the realm of technology and marketing for small-scale business and startups. He expressed how optimistic he is about the future of the web app in context to recent updates and developments. 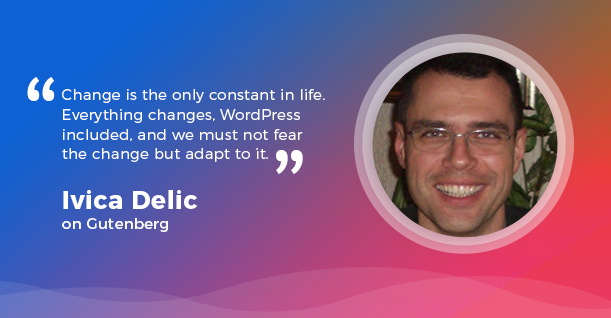 We interviewed Ivica Delic an active member of the WordPress community since 2011. He spoke to us early last year about why he chose WordPress, it’s simplicity and capacity to integrate with out-of-the-box CMS website templates. He also mentioned how the community helps each other with solutions non-selfishly keeping overall positive energy. Initially, he worked with Joomla CMS and found WordPress to be more fulfilling to the dynamic requirements of today’s bloggers. He explains the security threats present online and how to prevent attacks in the current era. The WordPress app developers continuously improve the CMS compared to its rivals. Nathan Kinkead is a buzzing blogger and an expert web developer that has managed to turn his blog into a revenue-generating platform. He spoke to is early last year as well and shed light on what’s important in setting up the blog and aspects to look out for. He talked about his journey of committing to his blog and publishing a number of articles on technology. He also believes that consistency is the key to pulling traffic, sustaining it and getting spikes on the blog viewership. The dynamic strategy of Google’s SEO then forced him to cater to a niche in order to decrease the fluctuation in the web-page viewership spikes. So he changed the subject from a general tech blog to a topic that gained most traction on his blog. He continued to pull more traffic and dominate that topic on his blog page. He concluded the talk mentioning how it’s important to create a niche, focusing on the design of the blog and changing the approach from making money to catering to the primary target audience. He also mentioned that Patience is the key in finding the road to building that traction. Read the full interview here: This Blogger Made $15,000 in A Single Month – Learn How! 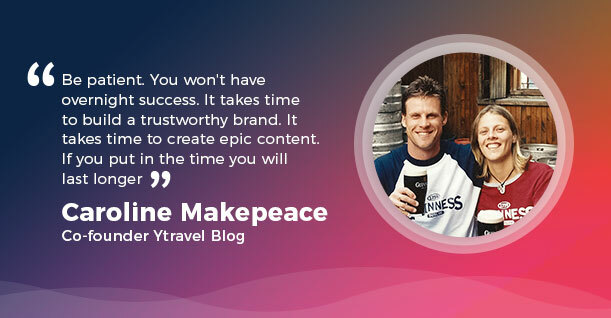 We spoke to Ytravel Blogger; Caroline Makespace who loves talking about her travel diary and hot destinations to visit. She shed light on making the blog authentic and not seeing it as an easy source of generating money. She found success in her blog by story-telling her experience of travelling with her partner to different destinations. She found that it was important to keep the blog fresh in terms of design and writing in a style that is easy and enjoyable for their readers. Caroline found passion in blogging because it provided her with a platform to generate travel allowance while also fulfilling her desire to write. She works as an elementary teacher while her partner is in the construction business, the couple faced many challenges in fulfilling their desire to travel. She mentioned that what worked for her was committing to travelling so her blog would get the freshness and authenticity in content. To be able to provide that she said that one has to Walk the talk. So she started her journey as a solo traveller and now is a family traveller. She also mentioned that it’s important to be an expert in on a region, thus she went on an 18-month road trip around Australia and is now replicating the same for other regions. 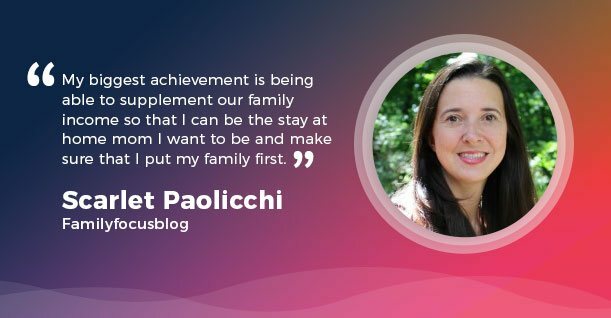 Scarlet Paolicchi, is mother’s blogger and provides tips and solutions in topics about mother care. Her blog has made her famous enough that she’s able to run her house on the revenue generated by her blog. We interviewed her in September, with curiosity at its brink about how she managed to pull this blog success story off. She explained the hours she spends as a store manager in retail were exhausting and she had to make a change to be able to give her children more time. So she started to write on topics about her experience as a mother. She noticed how this revenue generating venue was fruitful, however it needed committed time. According to her, the second biggest hurdle was to by-pass her fear of no one wanting to read her blog. But once she learnt to brush that aside, she started to improve based on the web page metrics and then started to enjoy writing. Her recipe of success entails, moving when one is not happy where they are and staying outside the comfort zone to achieve more. She believes that money should not be a metric of success, and fears are the biggest obstacle to achieving great things. With WordPress, you just don’t know what to expect. However, one thing we can be sure of is that this year will be filled with more challenges and new developments that will make WordPress bigger and better. And we will be right here in the midst of it. The post WordPress 2018 Year in Review: A Round up of Everything From The Past Year appeared first on WPblog.